However, thanks to webinars, coaches can finally stop exchanging their time for money. Instead, they can work once and get paid over and over again. Plus, thanks to webinars, coaches don’t have to master selling skills or try and figure out the latest marketing techniques. Instead, they can just monetize their knowledge and expertise on virtual autopilot. A webinar allows you to present to hundreds—or even thousands—of people at a time from anywhere in the world. In addition, the typical conversion rate of a webinar is 10 per cent (compared to websites which usually convert at 1 per cent.) In other words, to get one client, you just need 10 people to watch your webinar. Plus, webinars allow you to sell high ticket price products and services, as much as $25,000 whereas on websites, it’s almost impossible. What this means, is that as a coach, all you need to do, is put together a 60 minutes webinar, and present it once a week or once a month depending on how many sales you want to generate. For example, should your income goal be $10,000 a month, all you would need to do is present a webinar to 100 people and sell a $997 product. Identifying who you would like to target can be very tricky as a coach, as it’s so easy to simply say “anyone who has a problem they’d like to solve”. However, the key to a successful webinar is being very clear about your target audience. In order to make the process even easier, start first by listing all the people you’ve coached. Then, identify what their common denominator is. For example, the majority could have been women over 40. That will give you an indication of which section of the market is naturally drawn to you already. Then, identify which main challenges the majority of them were facing and needed guidance on. For example, it could be they wanted to start their own business but couldn’t afford to leave their day job until that business started bringing revenue. Lastly, list the people you enjoyed helping the most and who experienced the best results. By doing so, you’ll probably have shortlisted two or three people. These people will represent your target audience and your client avatar. 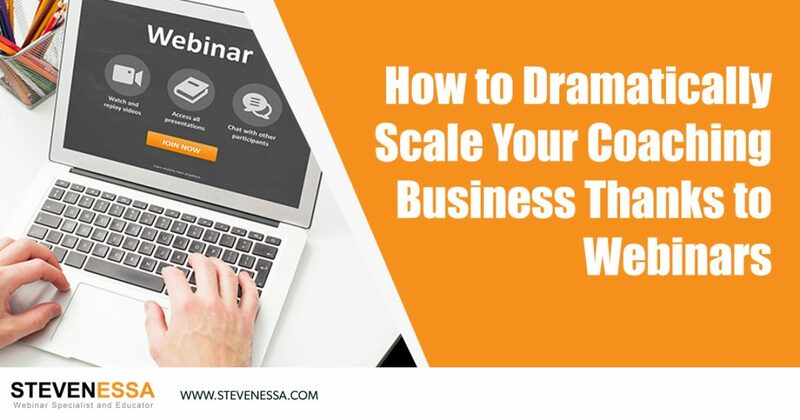 Therefore, when putting together your webinar and targeting people to watch your webinar, the whole process will be much easier as you won’t try and address everybody and try to appeal to everybody either. A standard 60-minutes webinar usually includes a 10-minute introduction, content structured into steps and a 10-minute close where a product or service is sold. For coaches looking to generate sales without having to exchange time for money, the structure remains the same. All you would need to do, is have an attention-grabbing headline with a big promise as the title of your webinar, such as “Attention career women: How to quit your 9 to 5 job and make 6 figures a year from your passion”. Then, put together the content of each step, making sure it only takes 8 to 10 minutes to cover each step. This part is where you’ll really be able to leverage your time. Instead of offering one-on-one consultations, either over the phone or face-to-face, you offer a series of webinars, also known as “video modules” or “video lessons”. The great aspect of selling further webinars is that you only need to create them once. Plus, you don’t have to create any if you don’t make any sales. In the unlikely event you don’t make a single sale, you haven’t wasted time creating a product. Once you have put together your webinar, you can leverage it for years to come by simply turning it into a replay. You can record your webinar using screen capture and editing software such as ScreenFlow or Camtasia. The same applies to your webinar series. Simply record each module and then upload the recordings onto a password-protected membership site where only customers can access the modules. To do so, you will need a WordPress website and the “Wishlist” plugin. In order to generate a consistent flow of clients without having to desperately chase business cards, go to networking events or heavily rely on word-of-mouth, build your mailing list. To do so, simply set up a lead capture page, asking for people’s name and email in exchange for accessing a free report or even your free webinar. When you do, you’ll start building a list of prospects you can email and turn into loyal, repeat customers. With this strategy, you don’t need any sophisticated marketing skills or sales techniques. Instead, you simply send emails to people who have not purchased your product yet either providing more value to them until they decide to buy or inviting them to your future webinars. So there you have it, the 5 simple yet very effective steps to scale your coaching business without having to lower your prices or work more.